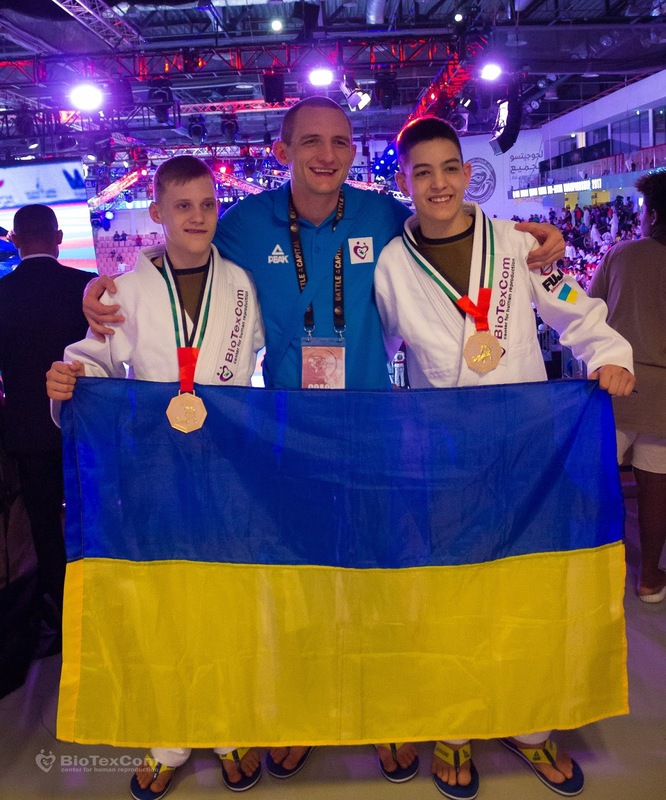 Fourteen-year-old Sergei Rusnak and Sergei Krasovskii have already been practicing jiu-jitsu for several years. At 14, they both have already become world’s jiu-jitsu champions. And boys are not going to stop there. Coach Evgenii Skirda analyzed boys’ fights and is pleased with their result. According to him, just in a few years Sergei Rusnak and Sergei Krasovskii will become the best fighters in the world of Brazilian jiu-jitsu. But they need to practice twice as harder to reach such a high goal. According to young winners, in future they are both planning to become coaches in order to enable other children to achieve what they have reached now. Boys opened up about their first experience in big sport, what helped them to win in Abu Dhabi and what exactly they need in order to achieve their main goals. These and other detailed below. I have been practicing jiu-jitsu for four years and I must confess that this sport has changed me quite a lot. First training I attended upon the advice of my older brother. As a result, I was amazed with almost everything I saw and heard. Evgenii (coach) explained and showed me everything in details. Thanks to him I began to train and achieve something meaningful in my life. We took part in numerous all-Ukrainian Jiu-jitsu tournaments. In particular, we were at the Ukrainian Championship, as well as at competitions that took place in Ivano-Frankovsk, Odessa and Zaporozh’e cities. Together with Sergei Krasovskii we have always been at the top. However, it was a kind of challenge for us to compete at the World Championship in Abu Dhabi. Firstly, fighters from other countries had higher training level. Secondly, our opponents used slightly different technical training. However, anything could stop us with Sergei and we tried our best to win. We didn’t think about second or third places. I realized how much was invested, so I didn’t have margin for mistake. I think our victory in Abu Dhabi is absolute merit of our coach. Evgenii invests tons of nerves, energy and he spent all his time training us. Some athletes, who failed, excused their defeat with lack of sufficient funding. But I think it’s just an excuse. To achieve our goal all we need is a partner and a mat. I became a world champion, but still there is always something new to learn. After the training together with Sergei, we enjoy watching how the senior jujitser are fighting. Thanks to this, we manage to adopt new techniques. Moreover, I think that we shouldn’t relax, even after the victory in Abu Dhabi. There are still a lot of competitions ahead. That's why now, on the contrary, we need to train even more and harder. And put twice as much effort and patience. I used to want to become a world champion. Recently I have already achieved this goal. Now I'll try to get a blue belt in ju-jitsu to get an opportunity to fight with older athletes. I want to be the first and the best fighter.